COPYRIGHT Record industry, film industry According to the British Phonographic Industry (BPI), counterfeiting costs the music industry £165m a year in lost sales as part of a total loss to piracy , including illegal downloads and file swapping, of something approaching half a million pounds in the UK and so it’s no surprise that the BPI has welcomed prison sentences for the ringleaders of what was one of Britain’s biggest and most extensive counterfeiting gangs. Sentencing after a BPI private prosecution at Durham Crown Court, His Honour Judge Hewitt, said “It is clear that this was a substantial operation, on a much greater scale than just friends and family. It caused an incalculable loss to the industry and would have continued had the industry not taken this action.” After a two week trial, ringleader James Glen Cowan, 41, was yesterday jailed for 2 years for conspiracy to defraud, tax evasion and benefit fraud. His wife, Ann Cowan, 38 was found guilty of conspiracy to defraud, benefit fraud (up to £30,000) and attempting to pervert the course of justice. She received a 9 month sentence suspended for 12 months and also has to spend 150 hours working unpaid in the community…. COPYRIGHT Internet, music publishing ARTICLE LINK – Should songwriters get paid for a public performance when you download a song? 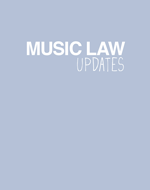 Well US publishing bodies ASCAP and BMI have brought a case in New York asking for this right http://www.theregister.co.uk/2007/04/13/steve_gordon_performance_royalties/ But a summary Judgement by Federal Judge William Connor has left ASCAP reeling after he ruled that the act of downloading a music file does not constitute a public performance of a song, stressing that “a person must be able to perceive the song as it is being transmitted” for it to be considered a performance. Digital music services AOL, RealNetworks and Yahoo! won the summary judgment after objecting to proposals put forward by ASCAP to include a performance fee for downloads. As a result of the judgment the services are not required to pay royalties for downloads to the performing rights organisation. The case goes forward to trial on 21st May.